Barzeh, Damascus 17/2/14. Courtesy of Lens Young DimashqiThe Syrian regime's rhetoric : socialist, secular, and anti-imperialist?Syria has been able to portray itself as an anti-imperialist state through its support for the resistance in Lebanon and in Palestine for many years now, and has taken strong rhetorical positions in opposition to Israel. But this stance is not based on anti-imperialist principles, but on putative ‘national interests’. These are guided by the necessity of ensuring the security and continuity of the regime as well as a balance of power in diplomatic negotiations with Israel to recover the Golan Heights area seized in 1967. The regime has actually collaborated with western imperialist governments on many occasions. It is the same regime that refused to assist the Palestinians and progressive Jordanian groups in overthrowing the conservative Hashemite regime in Jordan during the popular uprising in 1970, known as the Black September. This is the same regime that crushed the Palestinians and the progressive movements in Lebanon in 1976 with the tacit agreement of the west, putting an end to their revolution, while participating in the imperialist war against Iraq in 1991 with the coalition led by the US. They also participated in the ‘war on terror’ launched by President George W. Bush by collaborating on security issues. Israel has actually several times called on the US to ease the pressure on the Syrian régime, which has not shot a single bullet for the occupied Golan Heights since 1973. 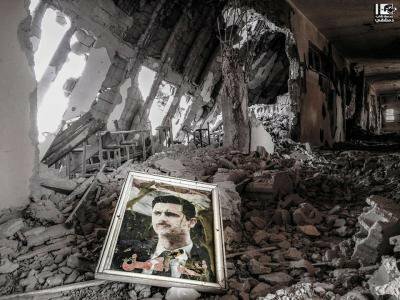 Syria has not responded to direct attacks on its soil widely attributed to Israel, including a 2007 air strike on a suspected nuclear reactor or the assassination of a top Lebanese leader, Imad Moghniye, in the following year. It also has engaged in multiple rounds of peace talks, most recently in 2008. Although these talks have not yielded an agreement, their repeated failure has led to nothing worse than a continued chill. Syrian officials have repeatedly declared their readiness to sign a peace agreement with Israel as soon as the occupation of the Golan Heights ended, while nothing was said on the Palestinian issue. Rami Makhlouf, the cousin of Bashar Al Assad, went so far as to declare in May 2011 that if there is no stability in Syria, there will be no stability in Israel, adding that no one can guarantee what will occur if something happens to the Syrian regime. As a result, it is not hard to understand Israel’s satisfaction with the status quo under the current Syrian regime. The Palestinian refugees in Syria are fully aware of all this, and have increasingly been participating in the revolution alongside their Syrian brothers and sisters. They too have suffered from the regime’s repression. The regime under the rule of Bashar Al Assad has continued the policies of his father and has increased the collaboration with religious associations and conservative segments of the society in conjunction with the new social market economy and the implementation of accelerated neoliberal policies. This has meant the withdrawal of the state in social subventions and many essential public areas. It should be known that prior to the commencement of the révolution, 30.1% of the population lived below the poverty line and almost two million people – or 11.4% of the population – had insufficient means to meet their basic needs. Real GDP growth and real per capita income has been decreasing since the beginning of the 90s. This has pushed the regime to continue its neoliberal policies and search for more private capital. In the area of health, notably, the regime has significantly retreated, leaving the initiative increasingly to charitable associations, and especially religious ones. In 2004, around 300 associations were providing a total of 842 million Syrian Pounds (SP) to more than 72,000 families. The most successful and notorious of these was the Jama’at Zayd, which has deeprooted relations with the Damascus Sunni bourgeoisie, conducted by the Rifa’i brothers, despite their well known opposition to the regime in the past. Despite having a rather opposing tone to the regime nowadays, the association did not hesitate to collaborate with them in the past, notably by obtaining the control of some new mosques at the expense of others, so that some of their members were able to procure important offices in various official religious institutions. Neoliberal policies have reinforced these religious associations, both Islamic and Christian, in Syria and in their hinterland of networks, increasing their role in society at the expense of the state. Around 10,000 mosques and hundreds of religious schools were built and more than 200 conferences headed up by clerics were held in the cultural centres of important towns during the year 2007. At the same time, the high religious establishments of all the sects were used by the regime as ostensible representatives of “Syrian civil society”, presenting an outward modern and consensual image of the country to any visiting foreign delegation. Bashar Al Assad did not hesitate to meet with the famous Youssouf Al Qaradawi, currently “supporting” the revolution against the regime, who visited Damascus in 2009 at the head of the World Union of Oulemas. The regime continued this policy of détente towards opposition Islamists that had commenced at the beginning of the nineties through the release of thousands of political prisoners in 1992, the tolerance of Islamists publications and of some movements as long as they refrained from political involvement. In 2001 for example, Shaykh Abu Al fath Al Bayanuni, the brother of the former head of the Muslim Brotherhood, was authorized to come back after 30 years of exile with his son, a rich businessman, who participated in the creation in 2010 of the first sexually segregated mall in Syria. These policies were also part of a strategy to create and deepen the rapprochement with the economic elites of Aleppo. These governmental measures were accompanied by the censorship of literary and artistic works, while promoting a religious literature filling more and more the shelves of libraries and Islamizing the field of higher education. This is true particularly in the humanities and expressed itself in the rather systematic referral to religious references of any scientific, social and cultural questions. The government also, in 2007, withdrew authorizations from two feminist organizations (the Social Initiative and one organization affiliated to the Communist Party linked to the regime) following pressure from various religious groups and personalities. At the beginning of the uprising in April 2011, the regime actively sought to reach out to the conservative sectors of society by closing the country’s only casino and scrapping a ruling that banned teachers from wearing the niqab. The regime banned the niqab from the classroom in July 2010, forcing hundreds of women out of teaching roles and into administrative positions. The regime also met with a number of religious dignitaries from different towns to try to appease the protest movement.